Vivitek launches £2500 HK2288 4K HDR projector | What Hi-Fi? Could 2018 be the year of the (more) affordable 4K HDR projector? 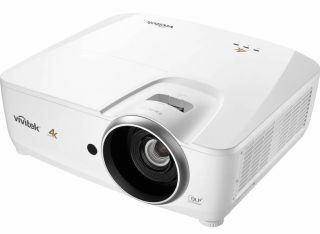 As 4K HDR projectors arrived on the home cinema scene in the form of Sony’s multi-thousand pound models (such as the Sony VPL-VW550ES) and the £35,000 JVC DLA-Z1, the advent of the brilliant and relatively affordable £3000 Optoma UHD65 was more than welcome. So much so, we gave it an Award. 2018 looks to be the year 4K HDR projectors will trickle down to the midrange market in force. BenQ has announced a sub-£2000 model (out in January) and now Vivitek has launched its own. The £2500 Vivitek HK2288 employs Texas Instruments' recently developed 4K DLP chip, which uses 4.15 million (2716 x 1528) mirrors and promises “optimal” black levels and a wide range of colours from its DarkChip3 and Brilliant Color processing. With its claimed 1,000,000:1 contrast ratio and 2,000-lumen brightness, the Vivitek seems (on paper, at least) equipped to make the most of the HDR10 format it supports. Its three HDMI 2.0 inputs allow 4K and HDR passthrough from an Ultra HD Blu-ray player. And as far as set-up goes, the Vivitek has a 1.39-2.09 throw, 1.5x zoom and vertical lens shift. The Vivitek HK2288 is available this month in white or black – just in time for Christmas.